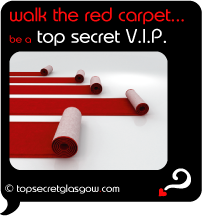 Do you like to get on the guest list and jump that queue to the best of Glasgow? So, get on the VIP list now while still open and free. For your eyes only, Glasgow Confidential is your monthly round-up of the very best from Glasgow's newly uncovered secrets for a good time in the city. We live here. We work here. We love here! So we scurry around the best places in Glasgow - always undercover - and update this constantly growing site for you with all of our experiences. 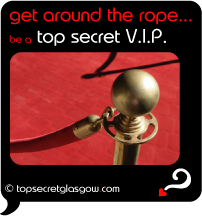 Get on the VIP list now so you don't miss a thing. You may be visiting for the first time? Or returning here to explore a bit more? We will go beyond the well-known things that make Glasgow the great city it is today. Glasgow gets a new tourist spin by revealing the best hidden secrets near all of those classics. Get on the VIP list now. Are you here on business and also want to add some "play" or "rest" to the "work" grind of your business trip? Well, we will brief you on all the benefits of our best-kept secret assets near where you do business. Stick that in your executive summary for a great biz trip. Get on the VIP list now. And what about you, fellow Glaswegian? Do you make the most of your wonderful home city? Well, we could probably all do that more. Let us help you uncover some funky places to go, things to do, sights to see... all sorts of weird and wonderful things that even you local lovelies haven't heard too much about! 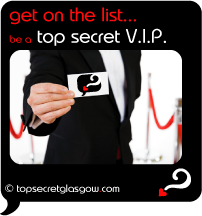 Get on the VIP list now. Forget quickly out-of-date printed guide books that never really have the latest inside track to the red carpet treatment.